Alexander Hamilton’s story is nothing short of remarkable. His rise to the top was so swift it became palpable. A now famous founding father, without a father, he overcame incredible adversity. Sacrificing everything so that we’d have diversity. He didn’t start with much financially. And sadly, his life wasn’t always sunny. But he left some awesome lessons when it comes to making money. And while the cost of a college education is rising rapidly, we still think that an education is still the foundation for a successful professional life. The data still shows that the highest salaries still go to college grads. Does this mean everyone should go to college? No. There’s many ways to get an education and college isn’t the only answer. There’s vocational schools, trade schools, free online learning tools, and a lot of different options for you. And from a financial perspective, not all colleges are created equal either. Make sure you understand the cost and benefits of going to a specific schools. If the starting salary for the degree you want is $45K and doesn’t increase much thereafter, then paying $50K for that degree might not make a lot of financial sense. That same $50K degree might be an awesome deal if you become a software developer, so just remember that the decision of where to study and how much to spend depends on many different factors. Knowing your values and making money decisions might not seem related at first. But they are. Because when it comes to making tough financial decisions and prioritizing how you want your money to be spent, saved, or invested, your values will guide your decisions. Alexander Hamilton, was perhaps a bit too stubborn, outspoken, and brash, but he knew exactly what was most important to him. You need to develop and be thoughtful about what you value when you make your monthly spending plan or budget. When I (Camilo) quit my first job to join a startup I took a pay cut. Several friends advised me to stay on Wall Street. After a few years I’d be making so much money I’d be set forever. But it was one of the easiest decisions I’ve ever made, because my values were guiding me. If you don’t know what’s important to you, you won’t be able to make the decisions that are best for you. The same thing applies to money. Take out a bunch of student loans to go to college. Graduate and work at the highest paying job. Buy a new car and the latest toys and gadgets that come out. Wear trendy clothes and dine at the hottest spots. Get married, take out a big mortgage to buy a big house. Go on vacations you can’t afford, fill up your house with a bunch of junk you won’t use, paying for it using credit cards. Work like crazy so that you can hopefully retire at 65, and then watch your kids do the same. And while the conventional path might be perfect for some people, it doesn’t mean you shouldn’t question whether it’s the right path for you. It’s okay to buy a used car even if you can afford to buy new. It’s okay to buy a modest house and fill it with love and happy memories, instead of buying a big house with rooms you’ll never use. Most millionaires don’t make $500K a year. Saving and investing 20% over your career is enough for most people to get there. You just have to be intentional with the way you spend and save. Living a conventional life and struggling financially, just isn’t inspiring to us. We want more. We want to be able to focus on building memories with our loved ones instead of worrying about whether we’ll be able to pay a bill. Bucking conventional wisdom has allowed us to do that. We saw our mom struggle financially our entire childhood. And we don’t blame her. She came to this country full of hopes and dreams. But she spent her life savings to battle the brain cancer attacking our dad. Left widowed with three children, she worked tirelessly to make ends meet. Sadly, it just wasn’t enough to be able to provide more than the bare minimum. Seeing her struggles showed us the importance of having a strong support network. We know for a fact that had our dad not gotten sick, our lives would have been much easier. He helped her lighten the load, and his absence caused us financial and emotional strain. Try to find ways to lighten the financial load. For young people, that means living with roommates in order to lower your rent, utilities, internet, and other bills. For working professionals that might mean making allies in the work setting who will go to bat for you when it’s time to decide promotions and raises so that you are compensated fairly. Don’t try to do everything on your own if you don’t have to. It’ll be so much easier. In this scene, Alexander Hamilton recounts that when he met his wife, he was broke. Yet Eliza Schuyler still wanted to marry him. He learned a valuable lesson that day. You are more than your money. Eventually we will all die, and no amount of fame or money will change it. So you need to make sure you don’t let your financial circumstances define you. Does that mean you should be okay not reaching for the stars or not building a secure financial foundation for your family? Go and try your hardest to make it happen. But don’t let the outcome define you. Learn to prioritize experiences and relationships over physical products. Those experiences are what will bring you sustained happiness. The high you get from a shopping spree is fleeting. Surround yourself with people who inspire you. Who push you to be better. Who make you happy and are positive influences. That, is what will fill your life with meaning. We recently shared 8 of the financial mistakes that we’ve made. To be fully transparent, we had a longer list we chose them from. And that’s okay. Because no one is perfect. 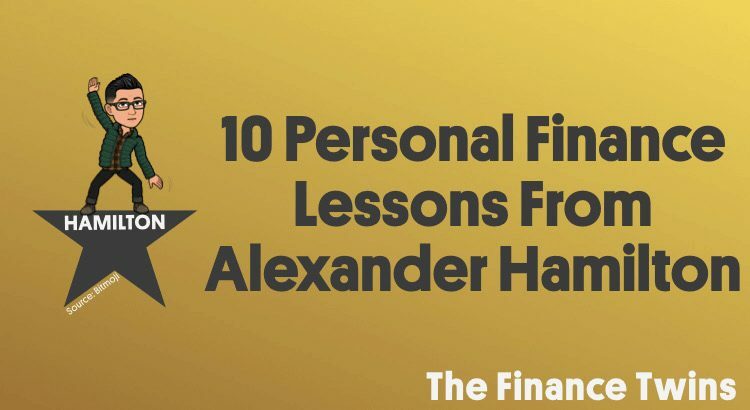 And since most schools aren’t teaching finance and money skills in school, it’s no surprise that so many lessons are learned from making mistakes. So don’t beat yourself up if you’ve made mistakes in the past. But it’s also not an excuse to continue to make the same mistakes over and over. We have tons of guides, calculators, and templates to help you make smart money decisions. We also use our Instagram to share regular money tips with you. Take advantage of these resources and share them with people important to you. It’ll help us grow and continue to help more people, and you’ll be doing your loved ones a favor by making smart decisions. Your days of asking friends and family for money will be over soon. Everyone has their own struggles. We don’t pretend to know what you are struggling with. Maybe it’s related to money, maybe it’s not. But this is a good reminder that appearances aren’t always what they seem. Most of our classmates in high school probably had no idea that we never had any money. To be fair we probably didn’t realize the same about them. We all spent every penny we saved on clothes or shoes to mask the financial pain we were suffering. Now that we are older, we have more perspective. We now realize that no amount of money will ever guarantee us sustained happiness. We know a lot of people who have a 7 figure net worth and are also miserable. We also know (and are related to) people who have much less but live full happy lives. No one has a perfect life. Your only job is to try to make the most of what you have to work with. And that’s okay. In 2018, both of us will become dads for the first time! And before you ask, no, we didn’t plan to have kids within months of each other. Although it’s pretty cool to go through this journey together. Kids are expensive. Both in terms of money and time. They drain everything you have. But while kids seem to take unrelentingly, they can also bring immense joy. It has renewed our drive to succeed and provide a secure childhood and life for our growing families. Working to provide a brighter future for your kids is noble. We got lucky and were able to overcome growing up poor, but many people aren’t as lucky. We don’t want to leave our kids’ futures in the hands of fate. That’s one reason we have life insurance, and you should too. In this scene, Hamilton’s wife pleads with him to go on vacation but he refuses. He has the means to go, but he didn’t want to leave his work. In the end, he stays behind and it ultimately costs him his career. It was during that summer that he has an affair and with it, loses his political credibility. And no, we aren’t suggesting that skipping a vacation will mean your career will fall apart. To be honest, having that kind of commitment to your job may even mean you’ll climb the corporate ladder more quickly. But there’s more important things than how quickly you can be promoted. And one of those things is your health. Your physical and mental health. Another thing more important is your marriage or committed relationship. Hamilton learned that lesson the hard way, and he ended up hurting both his career and marriage. Don’t be blinded by greed or professional aspirations. You don’t want to work so hard that you look back and realize you missed out on the best parts of life. We also have to acknowledge that not everyone has this luxury either. Not everyone can take time off from work. Growing up our mom only ever took us on 1 vacation after our dad died. She just couldn’t afford to take time off from work. She’d spend all day working and then in the evening she’d try to make it to our after school soccer games. We still don’t know how she did it, but we are glad she did. She is too. Alexander Hamilton was meticulous. He was detail oriented. And he tracked every penny he spent. A lesson that for many can make the difference between amassing true wealth or not. And he did it with pen and paper. Tracking how and when you spend your money is the first step you can take to get your financial life in order. It’s virtually impossible to change the way you spend money if you don’t have a clear picture of how and where you spend it. With online banking and apps to track your spending, there’s no reason you shouldn’t know exactly how much you spend on food in a given month. Or on gifts. Our step-by-step guide to building your first monthly budget is the perfect way to track and plan your spending. As the saying goes, ‘if you fail to plan, you plan to fail’. Don’t ignore your savings rate, it might determine if you’ll ever be able to retire. 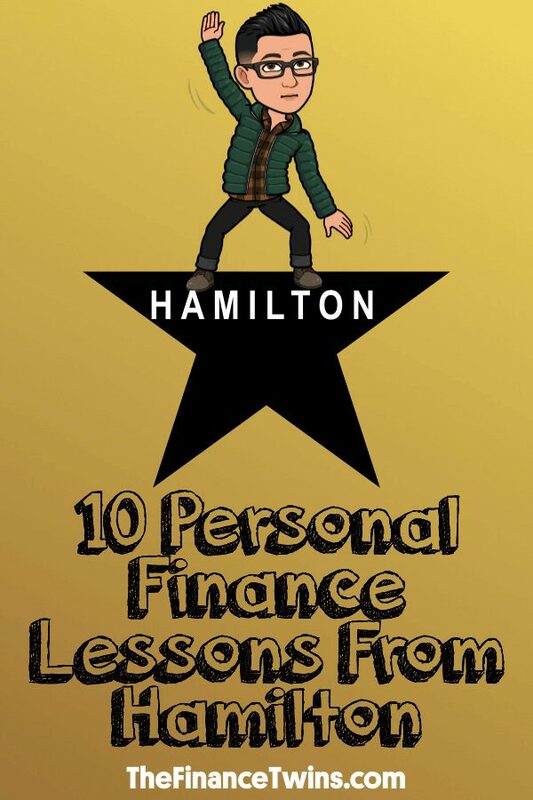 What is your favorite lesson from Hamilton? Great blogpost! I am a huge Hamilton fan and loved it. Well done. Thank you for reading! We are glad you are also a Hamilton fan!